It is nauseating to read that the Federal Government has ordered for the arraignment of the Chief Justice of the Federation, Hon Justice Walter Onoghen, before the Code of Conduct Tribunal on Monday on charges relating to non-declaration of assets. Though, the failure of the CJN to declare his assets is condemnable as it is below the dignity of his office and person not to declare his assets and liabilities, pursuant to Section 290 of the Constitution of the Federal Republic of Nigeria 1999 (as amended). However, it is an insult on the Rule of Law that the Buhari-led administration in its characteristic manner is about to act against the rule of law by ordering the CJN to vacate his office and also stand arraignment without recourse to Section 292(1)(a) and (b) of the Constitution. Aside from the fact that the present administration of Gen. Buhari has failed to invest heavily in the educational sector which shows how insincere this government can be, the government has been acting against the rule of law by detaining perceived opponents illegally at DSS facilities while violating several court orders to release political prisoners like the former National Security Adviser to President Jonathan, Col. Sambo Dasuki (rtd. ), Ibrahim El-Zakzaky among others. It is still fresh in the mind of millions of Nigerians and the outside world that this government does not have regard for the rule of law and is not ready to subject self to the stipulations of the law and this serves as a sad commentary on governance in the country. It is on record that while the then Chairman of the Code of Conduct Tribunal, Danladi Umar was standing trial, the Federal Government did not order him to vacate his office for the fear of interference neither did the case which was pressed against him in June 2018 see the light of the day after first arraignment. 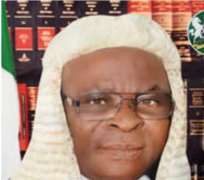 The sudden change of situation need be probed and understood by all Nigerians as the decision of the Federal Government to arraign the CJN before a law court is against the principle of the separation of power as clearly spelt out in Sections 4, 5 and 6 of the 1999 Constitution (as amended). By virtue of the judgment of the Court of Appeal in respect of the case of Justice Hyeladzira Nganjiwa v FRN (Suit No:CA/L/969C/2017) delivered on 11 December, 2017, the Chief Justice of Nigeria and in fact, any serving judicial officer cannot be tried by the Code of Conduct Tribunal and in any Court until the National Judicial Council (NJC) would have dealt with the matter. Though, the matter is still on appeal at the Supreme Court, the judgment still stands. As a matter of fact, based on that judgment, the Code of Conduct Tribunal had to discontinue the trial of Supreme Court Justice, Sylvester Ngwuta who was facing trial on alleged false declaration of assets. Similarly, the Federal High Court had struck out money laundering charges against the Supreme Court Justice based on this same judgment. Same thing in respect of Justice Ofili Ajumogobia who was later tried after the NJC had taken disciplinary measures against him. However, it is on this note I call on the Federal Government to rather concentrate on governance than the continued and undue interference and interloping in the activities of some other organs of government which poses a serious threat to democracy in the country. It is interesting to note that this undue interference which has become the trademark of this administration made this same government to hold the good people of the country to ransom for weeks during the leadership tussle in the National Assembly. Meanwhile, this attempt to subject our hard-earned democracy to ridicule by this government should be resisted by all Nigerians. Kazeem Olalekan Israel (GANI) is a 300-Level Political Science Student of Obafemi Awolowo University, Ile-Ife. Disclaimer: "The views/contents expressed in this article are the sole responsibility of Kazeem Olalekan Israel (GANI) and do not necessarily reflect those of The Nigerian Voice. The Nigerian Voice will not be responsible or liable for any inaccurate or incorrect statements contained in this article."